Pandit Nikhil Banerjee (1931-1986) was amongst the finest sitarists to emerge on the classical music platform in the post-independence era. He entered the profession at a time when vocal music ruled the scene, and formidable musicians like Ustad Vilayat Khan, Ustad Ali Akbar Khan, and Pandit Ravi Shankar were shaping a market for instrumental music. Under such daunting conditions, he created a niche for himself in the musical culture on the strength of his originality and musicianship. Recognition came late, but it came. When he died at the age of 55, he had been decorated with a Padmashri, a Padma Bhushan, and a Sangeet Natak Academy Award. He had, by then, cultivated a sizeable constituency in the US. Sadly enough, India discovered him after he acquired a cult-like following in the US. With Vilayat Khan and Ravi Shankar polarizing the stylistic spectrum, the domestic musical culture took time to accept a third option. Fortunately, Indian recording companies had, all along, remained interested in him, thus facilitating his re-discovery. Nikhil Bannerjee has thus become larger in his death than he was in life. Nikhil Babu was born at Calcutta in a conservative middle-class Brahmin family. 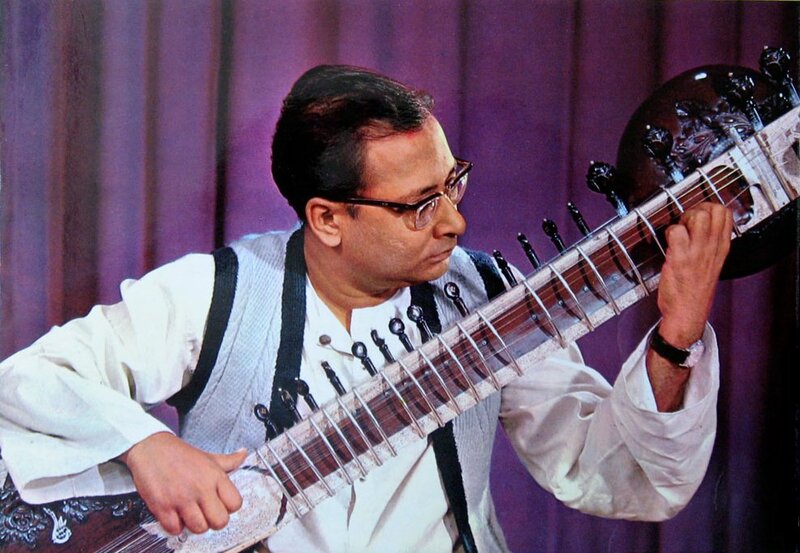 His father, Jitendranath, and his grandfather, both, played the sitar as a hobby. But, in his family, music was frowned upon as a profession because of its association with courtesans. Young Nikhil heard his father practice every day, and developed a fondness for the instrument. His interest in learning the sitar was also discouraged out of the fear that it might interfere with his formal education. Family resistance eased when Nikhil was 5 years old, and he was given a toy sitar to start learning. By the age of seven, his prodigious talent became evident, and his father started teaching him seriously. At the age of nine, he won the All Bengal Sitar Competition and also became the youngest ever broadcaster on All India Radio. In his childhood, he was deeply influenced by Ustad Ameer Khan, who was his sister’s teacher, and with whom he interacted extensively. He was also a great admirer of the leading vocalists of the pre-independence era – Omkarnath Thakur, Faiyyaz Khan, Kesarbai, and Roshanara Begum. In his youth, he learnt music for varying periods from musicians, who were part of his father’s circle of friends. By this process, he studied the sitar for a few months with the Seniya sitarist and surbahar exponent, Mushtaque Ali Khan, and the Tabla and vocal music with Bengal’s versatile genius, Gyan Prakash Ghosh. Thereafter, for several years he studied music with the aristocrat-musician-musicologist, Birendra Kishore Roy Choudhury. 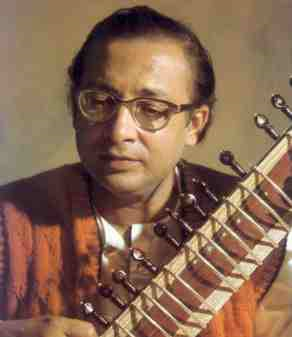 Roy Choudhury was an exponent of the Dhrupad genre, specializing in the Sursingar, Rabab, Rudra Veena, and the Surbahar. He was an encyclopedic treasure house of old compositions. Nikhil learnt hundreds of vocal and instrumental compositions from him in a large number of raga-s. As Roy Choudhury was not an active performing musician, he advised Nikhil to go to Maihar and study with Ustad Allauddin Khan. Once Nikhil had tackled the family resistance to the idea of a career in music, he faced an obstacle in the person of Ustad Allauddin Khan (Baba). The Ustad was over 70 by this time, and in no mood to accept any more students. After much persuasion, Baba agreed to listen to Nikhil’s next radio broadcast, and then decide whether he would teach him. Baba heard the broadcast, and pronounced it a piece of rubbish. But, he saw a hidden spark in Nikhil’s playing, and accepted him as a disciple. Nikhil packed his bags and left for Maihar to live and study with his Ustad. Then started Nikhil’s five-year long saga of studying under the greatest and, by all accounts, the most difficult, Ustad of the era. Baba had mastered several instruments, but not the sitar. Therefore, he taught his sitar students by singing the music, and allowing them to find their own technique for executing it. Baba consciously and systematically also steered Nikhil’s music into a direction distinctly different from that of his other sitarist disciple, Ravi Shankar. When Baba was satisfied that Nikhil was ready for the real world, he allowed him to launch his career. Even after launching himself in the profession, Nikhil did not stop being a student. Baba was too old by then. So, Nikhil spent five years in Bombay, studying with Baba’s son, Ustad Ali Akbar Khan. Thereafter, whenever he visited Bombay for concerts, Nikhil would also go to Baba’s daughter, Annapurna Devi, and take lessons from her. A look at Nikhil Bannerjee’s discography reveals his musical personality. Amongst available recordings — published and unpublished — the vast majority of the ragas featured are popular mature ragas like Darbari, Lalit, Marwa, Shree, Bairagi, Patdeep and Bhimpalas. In addition, there are “patent” ragas of the Maihar-Senia lineage — Chandranandan composed by Ali Akbar Khan, and Hemant reportedly conceived by Alauddin Khan. The listing also has a handful of raga-s adopted from the Carnatic tradition — Basant Mukhari (Vakulabharanam), Charukeshi and Kirwani. Semi-classical ragas seemed to have had a minor presence in his repertoire. I came across a Bhairavi rendering of his, in which he has treated the raga like a classical raga, rather than the more common thumree-style liberal treatment. 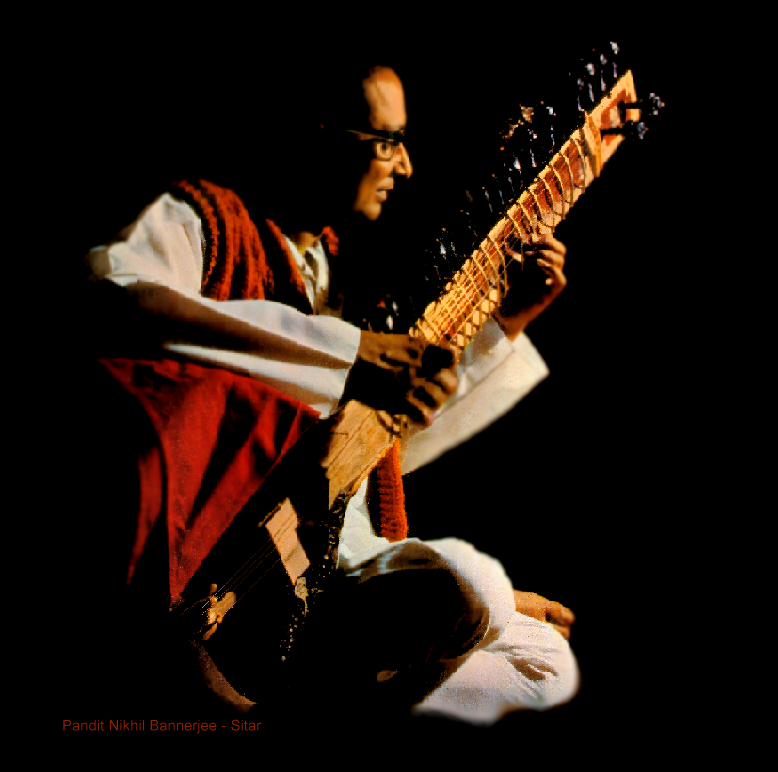 I also observe that, although he did perform in the modern medium-tempo Jhaptal and Roopak, a majority of his recordings are in the traditional Tritala format. These are indications that he was a musician of orthodox temperament in the classicist mold, who kept his music accessible, and occasionally displayed his mastery over the specialist repertoire of his lineage. Unlike his Maihar seniors — Ravi Shankar and Ali Akbar — Nikhil Bannerjee had only a minor presence as a duet artist. He is known to have performed duets only with Ali Akbar Khan. In addition to several stage concerts, the two also played brief (3 mts.) duets for a Bengali film, Kshudita Pashan (Hungry stones) and a Hindi film, Pheri. Nikhil Banerjee entered the profession at the toughest possible period of history. As he told the American journalist-photographer, Ira Landgarten in an interview (1986): “Of course, I had confidence after learning from Allauddin Khansahib but there was a great point in front of me: Vilayat Khan was there, and Ravi Shankar-ji was there, Ali Akbar Khansahib was there, and all these great stalwarts just in front of me! Until I’ve got some sort of individuality, who will listen to my music? After coming from Maihar, I was a little nervous for some time and I was really searching for a way to cut my own path because these three great instrumentalists hadn’t left a single point through which to take up and dig out your own way… As a whole [complete] performer, how to place your individuality in front of these great instrumentalists? These three great instrumentalists have not neglected a single phrase or portion of Indian classical music; they’ve got their own individuality and are really great”. As it turned out, Nikhil Banerjee did emerge as an original musician, whose style appeared to blend the finest features of the Dhrupad-derived Maihar (Ravi Shankar) style, with those of the Khayal-inspired Etawah (Vilayat Khan) style. This was not surprising considering that, Ustad Allauddin Khan had channelized Nikhil Babu’s musical energies in a direction different from that of Ravi Shankar, and other mentors had also given him a musical vision unfettered by either of the dominant sitar styles. It is inconceivable that Nikhil Banerjee should have developed his middle-of-the-road style as a conscious strategy because he was a conscientious musician, answerable only to his art. Despite entry at a difficult time for Sitarists, and departing early, Nikhil Bannerjee made it to the big league. Fortunately for the music world, he also left a large number of recordings in the personal archives of collectors and with All India Radio. Many of these have now been released in India and abroad. As a result, today, Nikhil Bannerjee has a fanatical following amongst segments of music lovers, who hungrily devour every recording of his they can lay their hands on. On January 27, 1986, the world of music lost one of its greatest artistic geniuses when, at the relatively young age of 54, the Indian classical sitarist Nikhil Banerjee died of a heart attack. Though largely unknown outside the realm of Indian classical music, Nikhil Banerjee was considered a towering figure by Indian classical enthusiasts in India and around the world. 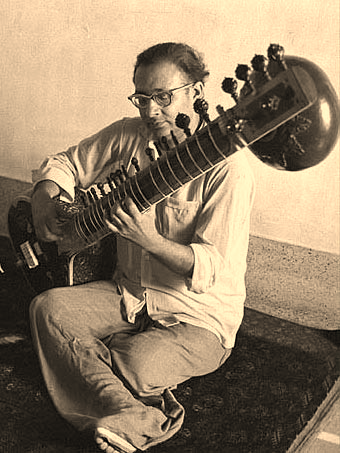 Nikhil Banerjee played a significant role in the extraordinary rise in popularity of Indian instrumental music, and the sitar in particular, over the past half century. To many Indian classical music enthusiasts, he was the most outstanding sitar maestro of the modern era. A warm and accessible person, shy and unpretentious, he deliberately shunned publicity. He played with dignity, without flamboyance or theatrics, concerned more with the integrity of the music than the response of his audience. As a result, he received very little media attention. Nikhil BanerjeeBorn in Calcutta on October 14, 1931, Nikhil Banerjee`s first teacher was his father, Jitendra Nath Banerjee, a noted sitarist. Young Nikhil grew into a child prodigy, and at age 9, becoming the youngest musician employed by All-India Radio. Jitendranath approached Mushtaq Ali Khan to take the boy as a disciple, but was turned down, instead Birendra Kishore Roy Chowdhury, the zamindar of Gouripur in present-day Bangladesh, was responsible for much of Nikhil`s early training. In 1947 he became a disciple of the revered guru, Baba Allauddin Khan. At first, Baba Allauddin did not want to take on more students, but changed his mind after listening to one of Banerjee`s radio broadcasts. Giving up his concert career, Nikhil Banerjee spent the next seven years studying under Allauddin Khan at Maihar. 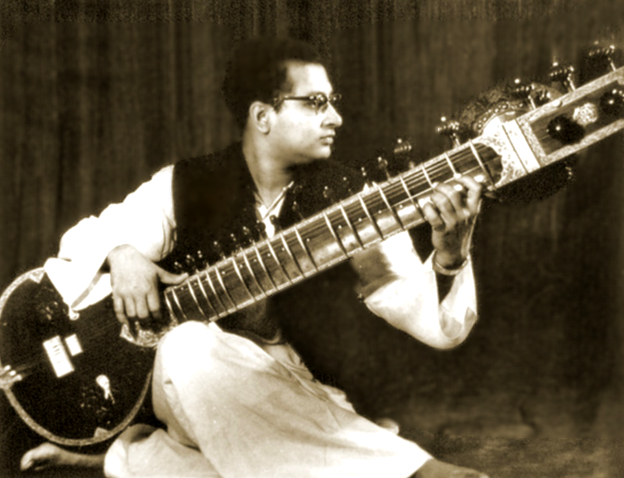 He was also taught by Baba Allauddin Khan`s son, the famous sarod maestro, Ali Akbar Khan. Nikhil Banerjee`s first appearance, after this retreat, at the Tansen Music Conference in Calcutta in December 1954, was enthusiastically received. Numerous foreign tours followed from 1955 onwards. Pandit Nikhil Banerjee`s total mastery over all the nuances of sitar playing, his ability to flawlessly analyze each raga and apply it in his music and his incredible command of his instrument was recognized throughout the world of Indian music. His stunning technical virtuosity was balanced by a meditative, introspective, and lyrical approach that, owing to his dedication, reached a depth of expression rarely achieved by others. In India, his performances are especially known for the purity of his classical style and the intense vitality of his improvisations. In 1968 he was awarded the Indian Government title Padma Shri and in 1974, the Sangeet Natak Akademi (the National Academy of Performing Arts) Award. His last public performance was in Calcutta on Friday 24th January 1986. The world of music lost one of its greatest artistic geniuses when Nikhil Banerjee died of a heart attack on January 27, 1986. In recognition of his greatness, he was posthumously given one of the Indian government`s highest civilian awards, the Padmabhushan. Last update 12th August 2011. This discography includes what I know about LP/Cassette/CD recordings of Nikhil Banerjee, presented by label. The earlier recordings were on EMI and related company LP issues, many subsequently reissued on cassette then CD. These provide a fair account of studio recordings with a limited performance timespan imposed by the medium. (Nikhil Banerjee is said to have disliked performing this way). The mid-90s saw the release of some interesting AIR (All India Radio) material. 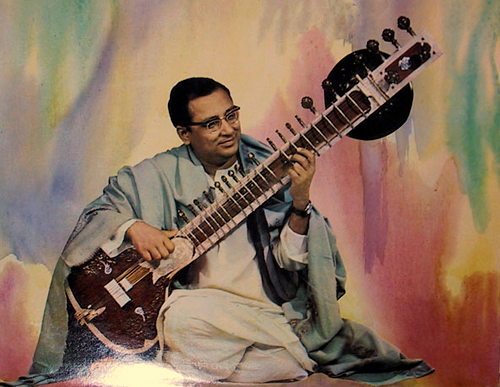 More recently the companies Raga Records and Chhanda Dhara have released an extraordinary series of CDs of Nikhil’s live performances, which are the best guide to the actual concert experience of listening to this great sitar exponent, who is often regarded as the 20th century’s master of the instrument and its music. Anthologies and compilations with a mixture of Nikhil Banerjee and other artists’ recordings have been largely ignored where the tracks on these are included within the solo albums below. Many of these issues are out of print. 78 rpm record with Ali Akbar Khan for the Bengali film “Kshudita Pashan”. A precomposed musical piece for a kathak dance sequence. Thumri by Amir Khan on reverse. Re-released by Amigo on CD as AMCD 904 & 905 in 1999/2001 resp. “These two CD’s are still available from Country & Eastern records, Sweden at the very reasonable price of £5. No tabla player credited, date unknown. Abhijit Banerjee on tabla Alternative title Pandit Nikhil Banerjee Lives Forever/The Best Sitar Player. SNCD 70900 Live Concert Vol 4 released 200? SNCD 70702 Live Concert Vol 5 released 200? 03 Kirwani with Anindo Chatterjee 1985? Shri – with Anindo Chatterjee London 1985? SNCD 70296 Live concert series 3 issued 1996? Puriya Dhanashree with Abhijit Banerjee London 1984 24/11/84? 02 Tabla solo (Teental) 12:20, w/Anindo not re-released. Puriya Kalyan rereleased on saregama “First Time on CD” CD. Rereleased on saregama “First Time on CD” CD. with Anindo Chatterjee BITS (Birla Insitute), Pilani, Rajasthan * with drut gat in Kirwani? EASD1490 Live at Berkeley 1991 (???) – No info on this. and by EMI (Australia) Ltd. under the HMV label, with the same title OASD 7538. Melodies of Noon and Dusk EMI CD PSLP 5128 (1989)? The order of the alap and gat is swapped on the CD version. 2011 – The BBC Sessions – Nikhil Banerjee and Anindo Chatterjee. Recorded 22/11/1978 & 01/12/1981. Rag Desh & Kedar. 2 CD set. Gathani 1010 A Rare Classic Collection rel 1992, date not known, 1984. CDC 3011 Gathani 1011 A Rare Classic Collection issued 1992? Cd issued 2002, date not known 1984. Tabla player credited on CD to Abhijit Banerjee. (By Raga Records discography to Abhijit Bandopadhyaya). Abhijit confirmed the performances were from the 1984 Europe/US tour. Musicassette 6TC 02B 5187 1980/1982? Raga Yaman Kalyan – Anindo Chatterjee on tabla. Live at Museee Guimet, Paris 2nd November 1983. 1985 – see Chhanda Dhara. This version may have fuller coverage of the Puriya Kalyan. Jaunpuri also on CDNF150166, compilation with other artists. See EMI/HMV for original issues of these tracks. Raga ? “From Sangeet Natak Akademi archives. Hem Lalit-Alap & Gat in Dhamar Taal Kanai Dutt? Hem Behag – w Kishen Maharaj ? The discography of Raga Records was very helpful in providing the impetus and backbone for this discography. Amongst many friends who have contributed information via the internet, Julianna and Bruce are notable for their dedication to accumulating information on ICM and correlating it. Kanti has a huge and well-documented collection of ICM cds and is generous in sharing his knowledge. Thanks Abhimonyu for the detail of the rare 78. Thanks to Louis for additional data.